The historical Plaza de Armas was built in the Inca period and is regarded the heart of Cuzco. 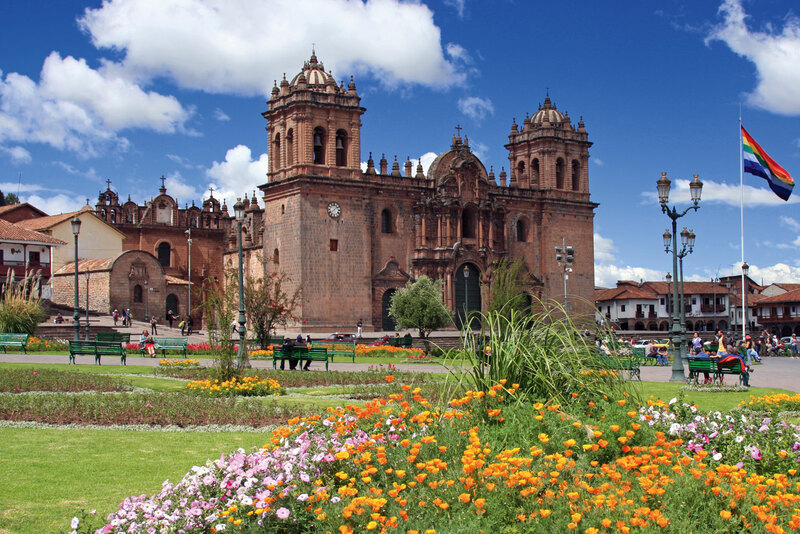 The Cuzco Cathedral dominates the square and is one of most visited sights in Cuzco. It went through two construction stages (first the Chapel of the Triumph was built on top of what was once the temple Suntar Wasi, and then later the cathedral itself was built over the remains of Inca Wiracocha). Today the cathedral houses a distinctive collection of paintings from the Cuzco School (the most famous being the painting of the Last Supper where Jesus is depicted feasting on guinea pig along with his 12 apostles). Pisco Sour at Museo Del Pisco, Cuzco. 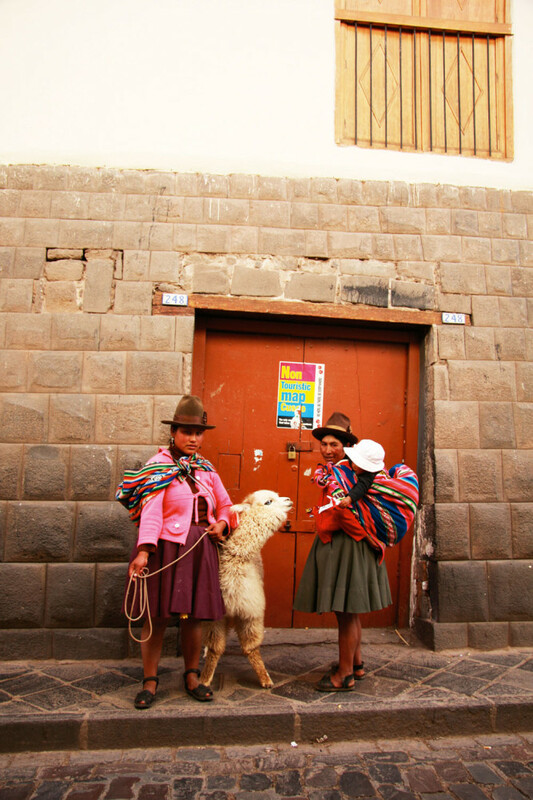 Cuzco locals in traditional dress. The courtyard at Hotel Monasterio, Cuzco. Senzo Restaurant at Palacio Nazarenas Hotel. The longest inhabited city of South America is more than just a gateway to Machu Picchu, Tatyana Leonov explores the rich culture of Cuzco. To put it simply, Cuzco (also Cusco, or Qosq’o in the Quechua language) is cool. It’s a colonial town with a hipster vibe and unrivalled archeological wonders. Colossal walls built by the Incas line the narrow, weaving cobblestone streets. Splendid churches and manors, built on a foundation of elaborately-carved stone, are found on almost every street corner. The hub of town, the Plaza de Armas, is one of the most beautiful and historic city squares in South America. If you’re into beautiful architecture, you will want to stay a while. Most people use Cuzco as the gateway to Machu Picchu. So although most people don’t stay longer than a few days (just enough to acclimatise) Cuzco has had to develop an infrastructure to cope with the influx of tourism over the last few decades. It’s known as the town where you stop before starting an adventure. This is the place for adventure, and you should stay a while… seriously! Cuzco does everything well. From white water rafting to museums, historical sights and fabulous food. Just wandering the picturesque streets is a delight, and if you’re a history buff, you’re in heaven. If you’re travelling to Peru via an international flight you will land in Lima, and from there most people fly into Cuzco. It’s an incredible way to arrive because of the amazing aerial view of the Andes from the plane. Check in early to get a seat on the left-hand side of the plane – it’s breathtaking. And flights are often overbooked or cancelled – another reason to arrive early at the airport. If you are able to, confirm your flight the day before. You can also get to Cuzco by bus, taxi or car, though roads are often closed during the rainy season – roughly October to March – and sometimes during the dry season too. Wander, stroll, roam – just make sure you pack your camera wherever you go. You could walk around for days without doing anything specific and be mesmerised by the breathtaking architecture. Initially, Cuzco was an Incan town with stone buildings, big squares and large and elaborate temples and palaces – all decorated with lavish gold. 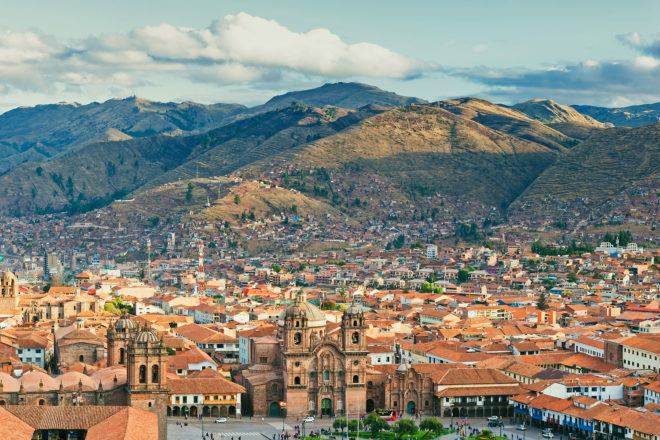 Much of the Incan architecture was destroyed and Cuzco was rebuilt with wide plazas, intricate mansions and stone churches from the Spanish colonials. Cuzco today is a miscellany of the two styles, and nowhere else does the architecture of the Incas and the Spanish intertwine in such a spectacular way. Each little laneway is a reminder of the antiquity of the town, and because of Cuzco’s incredibly rich historical significance, UNESCO declared it a World Heritage site in 1983. Most hotels are within a short stroll of Plaza de Armas, and this is where you should start. The Spanish-built stone precinct is the heart of Cuzco. This is where groups meet to decide where to dine that night, couples aimlessly meander, locals ramble and café owners wander trying to sell their latest culinary delicacy. If you want a baby alpaca jumper, tourist information, organic hot chocolate – it’s all here – or just a lane or two away. The Cuzco Cathedral (qosqo.com/catedral.shtml) dominates the square and is one of most visited sights in Cuzco. It went through two construction stages (first the Chapel of the Triumph was built on top of what was once the temple Suntar Wasi, and then later the cathedral itself was built over the remains of Inca Wiracocha). Today the cathedral houses a distinctive collection of paintings from the Cuzco School (the most famous being the painting of the Last Supper where Jesus is depicted feasting on guinea pig along with his 12 apostles). Inside, the late-Gothic, Baroque, and plateresque interiors emphasize the grandiose of the space. You’ll also find one of the most outstanding examples of colonial gold work, as well as silver-wrought pieces and detailed woodcarved altars. As you would expect, there are a few museums worth a visit. One of the most important archeological sites is the Museum of the Temple of the Qoricancha (Avenida El Sol). According to legend, the Qoricancha was built by the first Inca emperor, then expanded in 1438 by Pachacuti who built Machu Picchu. Today it’s filled with life-size gold statues and a large gold sun disc, and though the gold work is not original, it does give you a remarkable insight into Incan life. The Museo Inka (Cuesta de Almirante 103) celebrates the Inca history in Peru. Highlights include ancient jewellery, gold work, plus a whole wall of mummies (adults, children and even a pet). 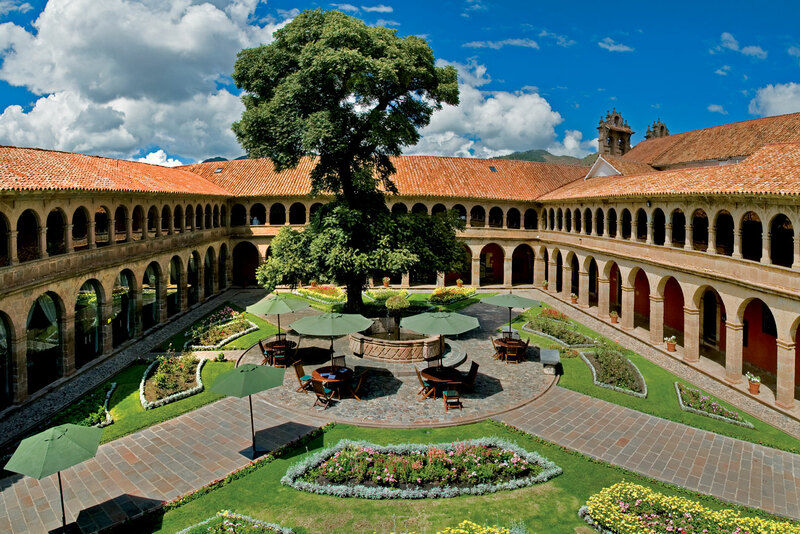 The Museo Historico Regional (Plaza de Armas) is housed in the colonial Casa Garcilaso de la Vega (the house of the Inca-Spanish historian) and exhibits artefacts relating to the cultures of the Chimu, the Chavin, the Incas, the Mochica and the Vicus, amongst others. There are plenty more, so if museums are your thing purchase a tourist ticket (boleto turistico) – it gives you access to most of them. If you’re only going to visit one market, make it the Mercado Central de San Pedro (Tupac Amaru). It’s loud, messy, colourful, dirty and great to explore. You’ll find aisles of fresh; colourful fruit, juice makers trying to entice you to their stall with their big toothless smiles, freshly-baked bread, quail eggs, cheeses, grains, crafts, bracelets, souvenirs, whatever you need someone is probably selling it. The meat aisle is a bit of an eye opener – sheep and pigs heads aplenty. If you’re after a super cheap lunch you can grab whatever is cooking that day at one of the stalls. Cuzco is the base for a heap of adventure activities. If you’re into white water rafting or rock climbing, you are in for a treat. With the flood of tourists over the last few decades, there are tour companies that cater to everyone. Do your research before you go if you are after something specific. Tucan Travel (tucantravel.com) are South American specialists and their Peruvian tours are particularly good. For fantastic tailored tours focusing on culinary, cultural and wellness experiences try Brisa Deneumositer (brisaculinaria.com) and Tanit Trails (tanittrails.com). Peru’s food is taking the world by storm, and Andean food is particularly interesting because of the unique and diverse produce. Typical Andean foods include corn, potatoes, quinoa, chilli peppers, alpaca and guinea pig, and there are a plethora of restaurants all catering to different tastes, from classic Andean eateries to top-notch luxe dining experiences. The ultimate place for fine dining with true Andean cuisine is Senzo (palacionazarenas.com), located inside the extravagant Palacio Nazarenas Hotel. Renowned Peruvian chef Virgilio Martinez, along with his team of Andean cuisine experts (who include a potato specialist and a Sacred Valley herbs infusion whizz), focus on creating food that combines authentic and delicate tastes with unique textures. Limo Cocina Peruana & Pisco Bar (Portal de Carnes 236, second floor) is the chic new place giving Chilean foodie Godfather Gaston Acurio’s Chi Cha (+51 84 240520) a run for its money. For the quirk factor, Fallen Angel (fallenangelincusco.com) is a crazy place to visit. The interior is nothing short of spectacular if you like getting lost in a fantasy world. Tables are in fact glass aquariums (so you might be eating a tender alpaca steak while watching fish swim between your food and legs). The heaven/hell-themed toilets feature flying pigs hanging off ceilings. There are also four rooms you can stay in, each with their own theme and décor extravaganza. Another quirky place with a decent menu and wine list to match is Devina Comedia (restaurantcusco.com). The waiters sing opera and the atmosphere is pleasantly eclectic. Greens (Santa Catalina Angosta) do green really, really well. Products are sourced from their own organic farm and the focus is local and seasonal produce. Menu items include wholesome soups and stews, salads, alpaca and more. The mango ravioli dessert is delicious! Whatever can be made from scratch is – bread, desserts, juices. UCHU Peruvian Steakhouse (Calle Palacio 135) is a hot stone steak house. The alpaca steak on the stone grill is fantastic and their causa (a traditional potato-based dish) is worth ordering. Cicciolina (cicciolinacuzco.com) serves up inventive tapas-style dishes like chilli-spiked trout, alpaca and guinea pig, with vegetables and herbs sourced from the Sacred Valley. They can also pack you a picnic if you want to take a day trip out to one of the many sights that are within walking distance. For a quirky fusion of Peruvian and Caribbean food in a cute and colourful space, Restaurant Inkazuela (Plazoleta Nazarenas 167, second floor) is another newbie that opened mid-2012 fast gaining popularity. If you’re after a big breakfast any time of day head to Jack’s Café Bar (jackscafecusco.com). This place is run by a fellow Australian, so you’ll be sure to find some menu items that you might be missing from home (think bacon and egg rolls, pancakes and more). No, it’s not traditional Peruvian – but sometimes you just feel like a taste of home. You’ll also find ice-creams, cakes and pastries on every corner. El Hada (Arequipa (Qhapchikijllu)) serves up superb organic ice-cream with some challenging flavours – purple corn or ginger-infused pineapple are part of the eight flavours featured on any day. Café Ayllu is a hot chocolate institution in Cuzco and, being in the home of chocolate, that’s a big call. It’s prepared the traditional way with ‘cuncho’ chocolate and organic raw cow’s milk. The local-roasted coffee is also made traditionally with sugar, orange and onion peels – for something a little bit different. The Choco Museo (chocomuseo.com) is the other place to visit for a hot chocolate. Plus you get a chocolate history lesson – you can watch the production process and they offer tours to cacao farms if you book ahead. Two drinks you must try while in Peru are chicha (typically fermented corn) and pisco sour. Pisco sour is easy to find. 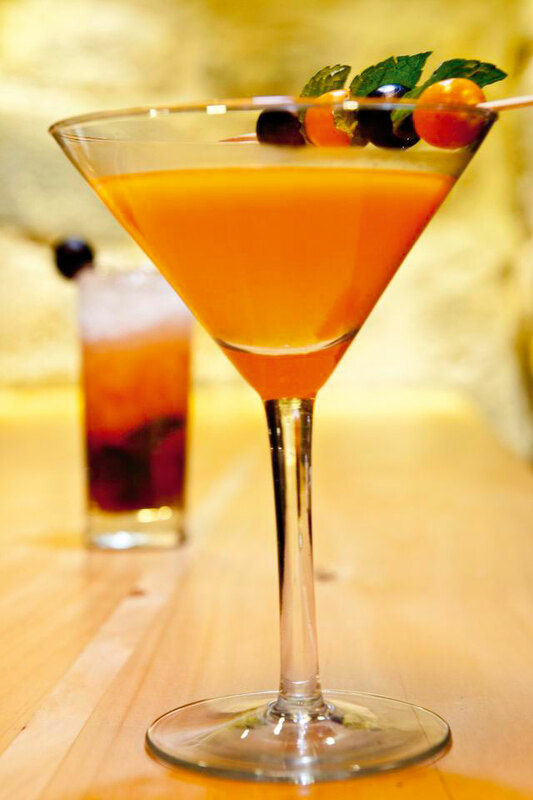 Almost every restaurant will offer it and bars will have pages of the drinks menu dedicated to it. The Museo Del Pisco (museodelpisco.org) opened in August 2012, and though it looks like it could belong in Paris, Kathmandu-clad clientele mix with trendy youngsters. This place is all about pisco sour (evidently) and the team even run a ‘make your own pisco sour’ class every day between 5:00pm and 7:00pm in high season. Chilcano de pisco (made with lime and ginger) is the most popular option, but you’ll be spoilt for choice – they’ve got 28 different kinds of pisco sour flavours on offer, as well as pisco cocktails. To have an authentic chicha experience, you definitely need to visit a chicheria, which are frequented by locals from 4:00pm. Your best bet is to ask a local, or the staff at your hotel, on where to find good chicha. If you’re just after a beer, both Paddy’s Irish Pub (paddysirishbarcusco.com) and Cross Keys (cross-keys-pub-cusco-peru.com) are safe bets. For a luxury stay with prices to match Palacio Nazarenas (palacionazarenas.com) by Orient-Express is divine. Every suite features top-of-the-line amenities like a BOSE sound system, mobile phone and an iPad with city guides and tips. Oxygen is also piped into the rooms to gently acclimatise guests to the altitude. Senzo is here and the heated infinity pool and spa are both great places to unwind. Hotel Monasterio (monasteriohotel.com) is a former monastery and national monument dating from 1592. With 126 rooms, some offering city views, it’s another plush place to stay. Some rooms also come with oxygen enrichment if that is something that takes your fancy. 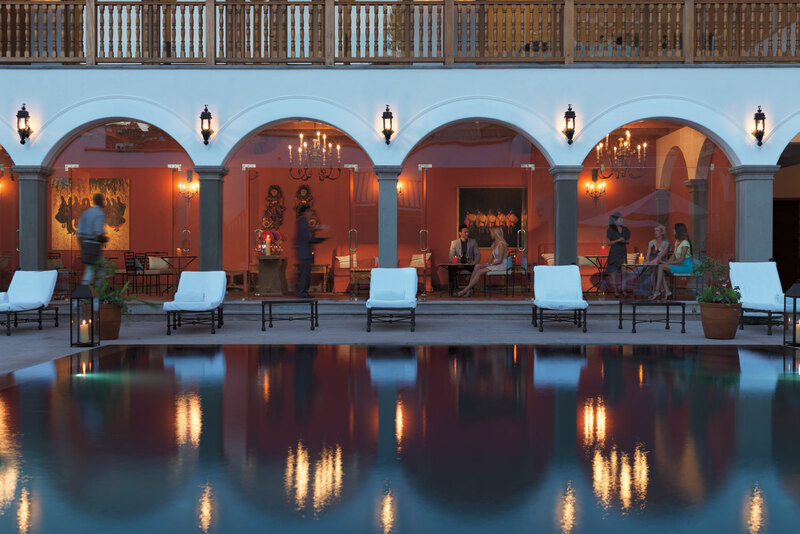 Other luxury hotels to consider are Casa Cartagena (casacartagena.com) and Inkaterra La Casona (inkaterra.com/en/cusco). For a mid-range option Novotel Cusco (novotel.com) has everything you need. They offer clean, spacious rooms, a buffet breakfast and are happy to accommodate specific requests. Like a lot of the other hotels, they also do a packed lunch if you’re heading out for the day – just remember to book the day before. Other mid-range options include the Marriot (marriott.com.au), which opened in September 2012, as well as Tierra Viva Cuzco Plaza (tierravivahoteles.com) and Casa San Blas (casasanblas.com) for a boutique mid-range stay.